Okolie, 26-years-old, will return to the ring against an opponent to be determined on February 2 at The O2 in London. Eddie Hearn, who promotes Okolie, has mentioned Lebedev, a former WBA and IBF world champion, as a potential opponent. While Lebedev is 39-years-old, he is still very dangerous and possesses a lot of knockout power in both hands. “Yeah, 100 percent, that’s a fight I would take, sooner rather than later,” Okolie told Sky Sports. After gaining several impressive wins on the domestic scene, Okolie is now looking to test himself further against much stiffer competition. “I will show a little bit more of myself. 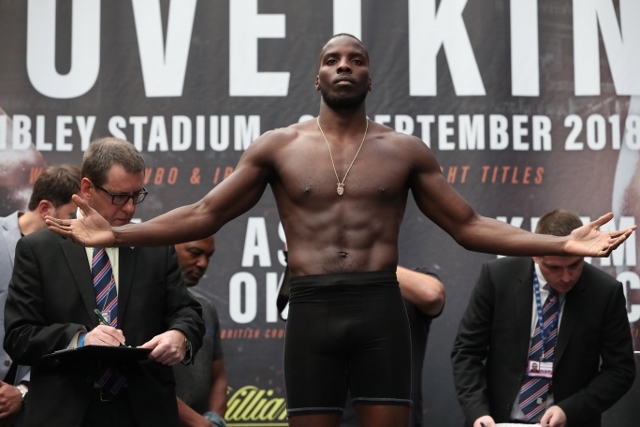 I’ve been boxing a bit safe, within myself,” said Okolie. “Safe in the sense that I know I’m a big, strong guy, with power. I just rely on that, because it’s safe. Where now, I’m going to show a bit more skill I believe, a bit more relaxation. I think I’m past the stage of caring now about [being] undefeated.